It’s no secret I love giving gifts to friends, family, the occasional stranger and even myself. To that end I totally embrace Christmas and for me my Christmas Spirit begins the day after Halloween. 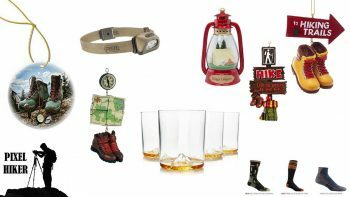 I start looking at holiday gift guides for hikers on other websites and was somewhat disappointed as they were all click bait to get visitors to buy stuff. While I understand that is a fact of life for owning and operating websites I also feel there has to be balance. This Christmas or Holiday Guide is a little different. First off I consider all the gifts on this page to be “Stocking Stuffers” and I happen to own many of the gift suggestions even if I do not include my own pictures (I started this page in October). Many of the links will take you to Amazon, there is no way of avoiding it these days but other links will take you to the appropriate source. Anyhow I hope you find this useful, I will add more pictures and gift ideas as I find them and of course if you have something positive to say are a Hiking Christmas Tree ornament suggestion or any uncommon stocking stuffer suggestion that would appeal to visitors of this site please share it at the bottom of this page. 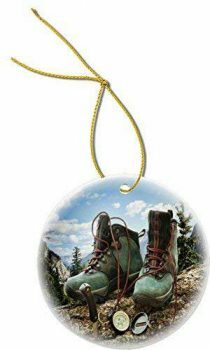 What makes a better stocking stuffer for hikers than hiking and outdoors themed Christmas Tree Ornaments? Nothing is better! Your recipient gets a neat ornament on Christmas and every year they will proudly display them. I like to write the date on them in permanent marker in an inconspicuous place if possible. This helps tie the ornament to a memory. 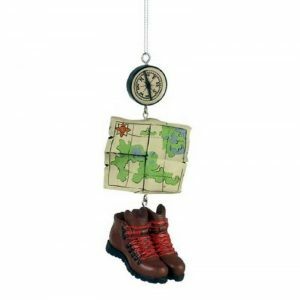 This is a cute porcelain finished ornament that features a compass, knife and a pair of hiking boots against a mountain trail background. It’s $17 and the type of ornament that can last generations. This ornament by Kurt Adler is so awesome I would be tempted to leave it up year round. 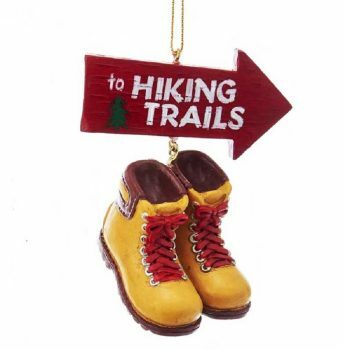 I feel this ornament sums up hikers. This ornament is a favorite of my girls. The hiking boots look like the pair she owned when we first started hanging out, drinking beer and of course hiking back in 1987. We didn’t start dating until 1990-91. I bet she still has the boots at her parents. 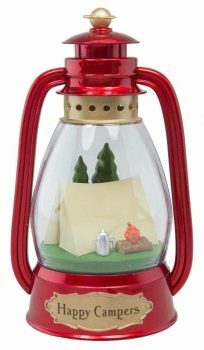 This Hallmark Gold Crown Exclusive Happy Campers Lantern Ornament needs no words describe it, Hallmark did a great job with this cute lantern ornament. 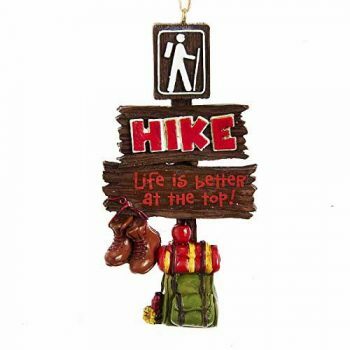 It will please hikers, campers or just about anyone else who enjoys the great outdoors. As a kid I think there were many years I enjoyed my Christmas Stocking gifts more than the big gifts. A gifts physical size often had little to do with fun factor of a gift. This hasn’t changed for me and to this day I still enjoy buying awesome stocking stuffer gifts for my girl. Below is a few items I think any hiker would enjoy finding in their Christmas Stocking. Available in men’s and women’s styles, constructed of Coolmax or Merino Wool Darn Tough Hiking Socks are considered by many to be the best hiking socks available. Darn Tough Socks are made in Vermont USA and carry what is probably the best guarantee in socks “Our unconditional lifetime guarantee is simple and without strings or conditions. If our socks are not the most comfortable, durable and best fitting socks you have ever owned, return them for another pair. No strings. No conditions. For life”. I was visiting my local bike shop, Class Cycles in Southbury, Connecticut and something caught my eye. That something was the Stanley Classic Flask in all it’s retro glory mounted in a special water bottle cage for a bike. I was excited like a kid. For me it brings back quite a bit of nostalgia from my childhood. You see back in the the day (I’m 52) the green enamel Stanley Thermos Bottles were THE THERMOS TO OWN. They kept your hot food & beverages like soup and coffee hot and your cold drinks cold. My mom lived out of hers. Like I said seeing the flask I just had to buy this for my girl it spoke to me. While I bought the flask in the picture as a bike gift it is a well regarded flask among hikers and backpackers. 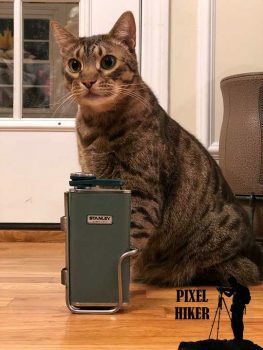 My Ocicat Ryan Reynolds seems to like it too. 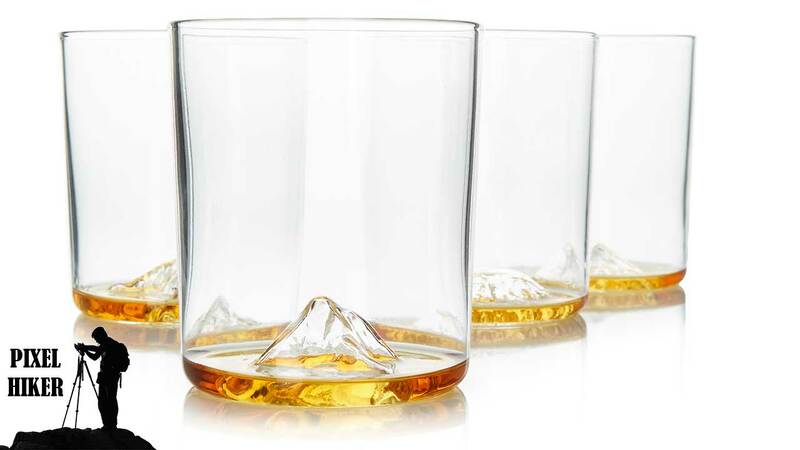 OMG we just love the WHISKEY PEAKS ROCKS GLASSES. Now we don’t drink any whiskey around here but we do enjoy drinking iced tea and drinking it from the Mount Washington glass. For me it makes me daydream of being there and reliving fun memories. 2016 marked the centennial of America’s National Park Service, so we decided to celebrate the best way we know how: by raising a glass. In this case, Whiskey Peaks, a handsome set of two hand blown whiskey glasses made from premium lead-free glass. 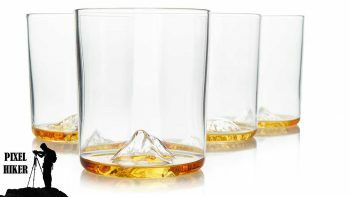 Featuring a raised topographic impression of some of the greatest, most majestic peaks in the world, Whiskey Peaks will keep you inspired and sippin’ “on the rocks” whenever 5 o’clock calls. Reliable lighting should be part of any hiking backpack and it also make a great stocking stuffer. I personally LOVE getting lights for gifts and I love buying and testing various lights. Part of your lighting needs should be a headlamp. Headlamps are great for providing hands free light while doing just about any task in the dark. 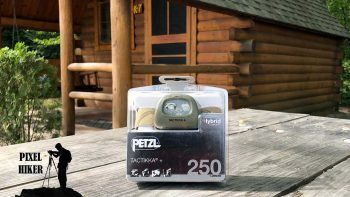 Lately I have come to prefer Petzl headlamps and have bought two since August. Designed for activities where stealth is key (hunting, fishing, nature watching…), the TACTIKKA + headlamp offers a powerful 250 lumens of lighting. It features a very long burn time and great lighting versatility: proximity or focused lighting for movement, and red lighting to preserve night vision and ensure stealth. TACTIKKA + is a HYBRID headlamp that is also compatible with the CORE rechargeable battery. I’m not certain of the correct terminology whether it’s dry sacks or stuff sacks but they are so useful in organizing a backpack. I had some Walmart ones briefly but they didn’t last. If anyone who knows me that buy’s me Christmas gifts I would LOVE a few of these Kammok Buuro Bag Stuff Sacks. They review very well and the safety orange can be a bonus in a signaling emergency. They are inexpensive and the smaller sizes definitely fit in a Christmas Stocking. Visit Kammok and start your holiday shopping…for me. Instantly add organization to your gear bag. Five sizes range from 1-16 L with a water resistant coating to keep your gear dry and orderly. The bags have built-in button snaps that attach to your hammock, backpack, or ridge line. I now own two of these Fenix PD35 V2.0 2018 Flashlights kits and I gave a 3rd to Erin. I use one for hiking and walking the dog and the other stays in my Nissan Murano. The light is very compact, light and incredibly bright. The kit includes a special battery part#18650 that can be charged with an included micro USB cable. It will also operate on traditional CR123A batteries such as Energizer Lithium. This kit isn’t cheap but I think once you try it there’s no going back to another flashlight. 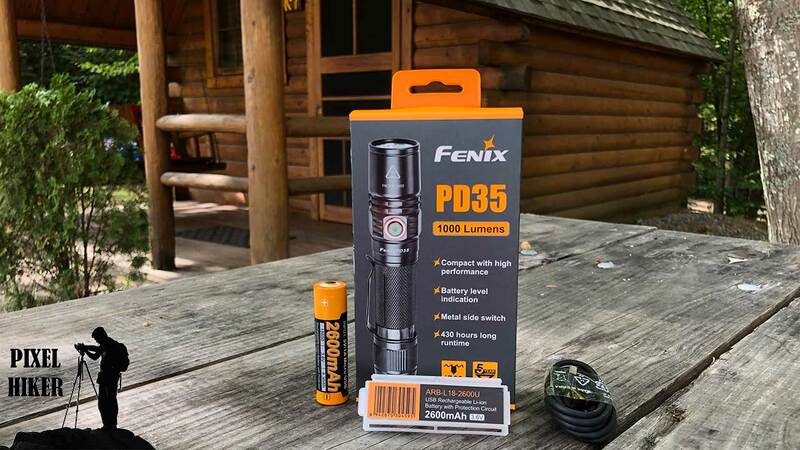 The Fenix PD35 is a great stocking stuffer. Weight: 3.1 oz. (88g) weight excluding batteries. Battery (included): One rechargeable 18650 Li-ion battery or two CR123A batteries (Not Included). NOTE: The light will not work with flat-top 18650s. We recommend any of the ARB-L18 series from Fenix. 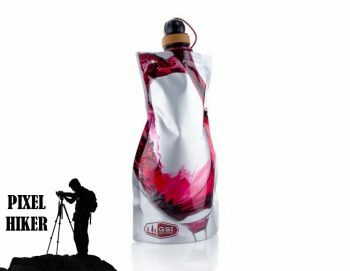 Is there a wine drinker in your hiking group? I’m sure they would love the cool $9.95 GSI OUTDOORS SOFT SIDED WINE CARAFE. I know Erin and my girl would love to get this as a gift and one of them will. Should lead to heck of a review. Buy it at REI or direct GSI Outdoors. While your at GSI check out the rest of their alcohol carrying products. Your Welcome. 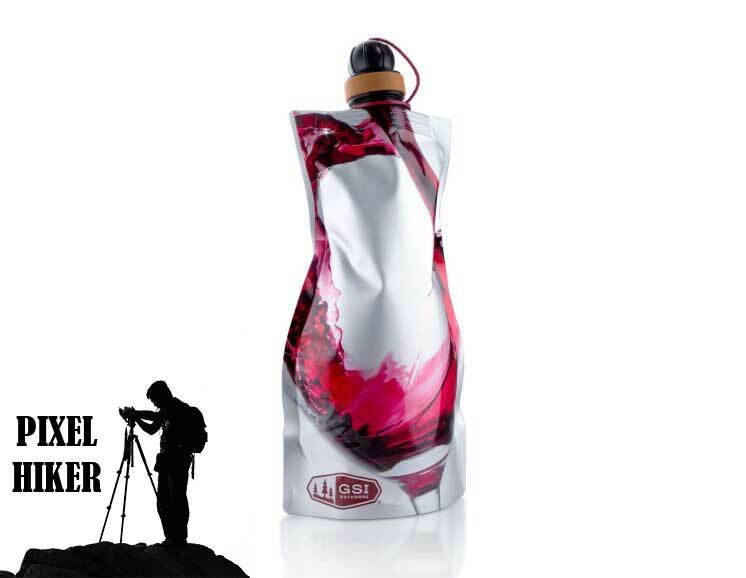 The Soft Sided Wine Carafe designed to transport your favorite wine into the backcountry- or just to your picnic. Leave behind the bulk and weight of the wine bottle, you stay light on the trail. I'm a simple middle aged guy who has devoted my lifetime to spending as much time as possible outdoors. My favorite activities include driving my Jeep Wrangler Unlimited, Mountain Biking, Cycling, Hiking, Fishing and walking my best friend GSD "Mr Sullivan". My other passion is photography so I try to include my trusty Nikon D810 in as many of my outdoor activities as possible.